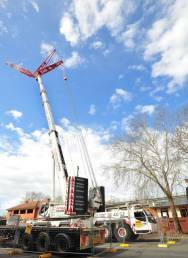 Another massive crane has come to Wagga, this time to help install concrete panels in the Wagga courthouse redevelopment. Supplied by Titan Cranes, the mobile six-axle crane has a 70m telescopic boom and a fly jib that takes the maximum tip height up to 132m. The crane is operated by four people. Sturt Street and Barrand Lane have been closed between August 9 and 16 for the work. The courthouse precinct is being extended and upgraded at a cost of $17 million.